I have had some great times Affirming Gender so far this summer, and can give some good reports. Encountering the select assembly from Millersville Bible Church in June was so very encouraging because I met a group of people who wanted to actually do something to help those with sexuality difficulties. Lancaster County—always full of surprises. Their enthusiasm testified to the care of the church for those in need. We discussed the best way to disciple people who struggle with various issues and ended up covering a lot of ground on the “how to’s.” May God supply every need of those who step forward to walk alongside fellow sinners in need of Christ’s grace. 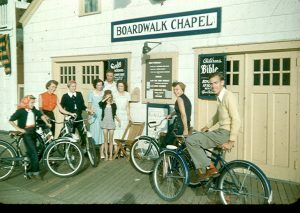 Secondly, I considered it a great privilege to be part of the equipping operation of the The Boardwalk Chapel staff last week in Wildwood, NJ. I have not seen the likes of this unique ministry. 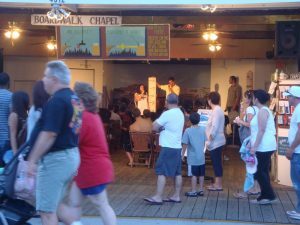 Sponsored by the OPC presbytery of New Jersey, and overseen by local pastor, Jim Zozarro, the work transforms the Boardwalk experience into a venue for talking about things that really matter. For those in Southern Jersey, and for many travelers coming across or down the coast from metropolitan areas, Wildwood is the place to go. An immense public beach, big convention center and a multi-piered, roller-coastered boardwalk make it a vacation destination. And if you know the boardwalk scene from any number of other U.S. coastal towns, you can visualize the tendency to ephemeral amusements. Imagine walking down a boardwalk confronted with boardwalk choices: funnel cake, target shooting for stuffed animals, extreme spring machine riding, palm reading, fried Oreos, or…hey, what’s this, live music (and good music), quality stage presentations, and people engaging you in conversation about God. After hours of cotton candy, what would you choose? The great value of the Chapel is in this. 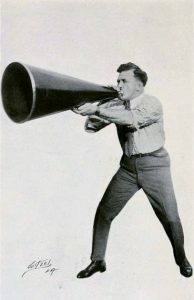 It is set up to train young people who want to learn how to speak with people who do not believe as they do. This is a dire need for anyone in our culture, but especially for people with a precious message to communicate, namely, Christians. In the mass of humanity strolling and working in this span of two miles, one encounters people from all over, not just the country, but the world. I met people from Russia, Poland, Tailand, China, etc. All kinds of accents. All kinds of beliefs. Right along with the New Jerseyans. Many of them do opt, in that relaxed environment, to consider matters of faith. That is where AffirmingGender came in. I was helping the staff to understand and communicate a different way about masculinity, femininity, gayness and transgenderism, pressing issues of course. When you speak of matters of import for people, the meaning of gender in relationship often comes up and sparks disagreement. I presented a compassionate apologetic for how Christianity appreciates the gift of gender. I hoped this would help in engaging obstacles to faith. Even during one of the breaks in my training, which was also open to passers-by, I witnessed an encounter between an inquiring woman and one of our youth. The inquirer brought up that she was gay, and the young person used the training to talk graciously about sexual desires and identity in a way that the inquirer had not considered. The exchange gave her something to really think about. Very cool, I thought. Even better than funnel cake. Check back with the AffirmingGender Summer Calendar for updates on further appearances of AffirmingGender ministry in the coming months. Stay tuned for upcoming interviews. Very thankful that you and your family were able to come and visit and we were all blessed by the training! Thank you also for the mention and some staff reviews are on their way!